Pride Of Ownership In This Gem, In Desirable Hicksville Neighborhood. This One Has It All. Full Finished Basement, Large Eat In Kitchen, Patio W/ Lights. All Situated On A Wide, Beautifully Manicure Property & Huge Yard. Very Convenient To School, Great Shopping, Parkways, Lirr. Move Right In. 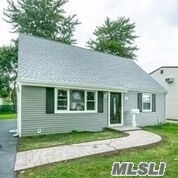 This Home Comes With A Brand New Roof, New Siding, New Windows, Gleaming Hardwood Floors, All Updated & Newly Renovated Extended Cape House With 4 Bedrooms, 2 Full Update Baths, Best Deal In Town.